This software allows calculation of evaporative losses from a water body using the stable hydrogen and oxygen isotope composition of water. The mathematical algorithm is based on a modified version of the Craig-Gordon model. The user can choose between a steady state and non-steady state model and select one of three options for estimation of the stable isotope composition of atmospheric moisture. 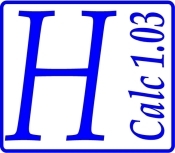 Hydrocalculator is provided free of charge and is distributed in the hope that it will be useful. This software is provided "as is" and without warranty. Use at your own risk. The authors hereby disclaim any liability for the use of this freeware software. If you do not accept these conditions please do not download or use Hydrocalculator. Skrzypek G, Mydłowski A, Dogramaci S, Hedley P, Gibson JJ, Grierson PF, 2015. Estimation of evaporative loss based on the stable isotope composition of water using Hydrocalculator. Journal of Hydrology 523, 781–789.